Do you feel like your leg day is missing something? Want more than the typical squat-and-deadlift routine? Well, you’re in luck: Here’s a tough leg workout that targets both large and small muscle groups, all the while challenging you with strenuous cardio intervals. 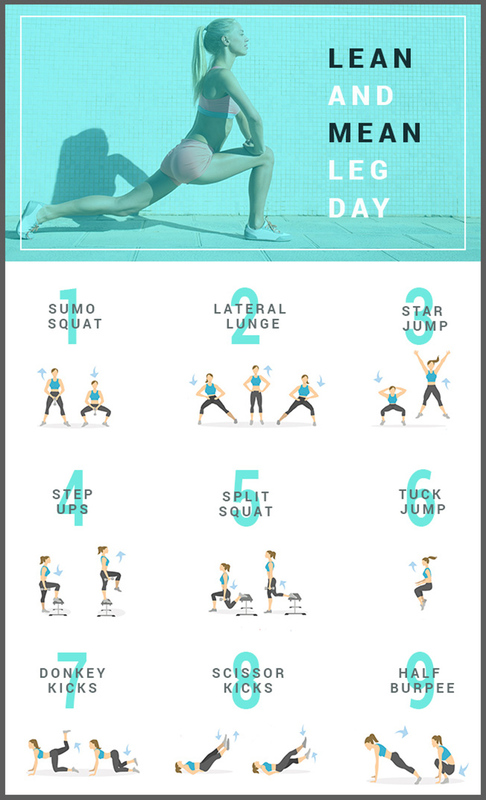 The routine should take you approximately 40 to 45 minutes and is structured as a HIIT (high-intensity interval) workout, which includes both weight and cardio exercises. Complete 5 sets of 16 for each exercise. Stand with feet wider than shoulder-width apart and your toes slightly turned out. Hold a dumbbell with both hands in front of your hips. Push your hips back and lower your body into a squat position, keeping your back straight and knees pointed out. Make you’re your knees are not over your toes as your squat. Raise your body back to starting position, keeping your chest up. Begin by standing with your feet shoulder width apart, hands on hips. Step with one foot to the right and move your entire body over right leg, maintaining a 90-degree angle with your right knee. Keep your back straight through the exercise but your glutes and hips pushed back. You can add weights in each hand to add more resistance. Begin in a relaxed stance with your feet shoulder width apart. Squat halfway and explode back up, using your momentum to travel as high as possible. Fully extend your entire body into the air, extending your legs and arms to your sides and away from the body, making a star shape. Take a small breather — you’ve earned it — before moving on to step ups. Place your right foot onto the bench or chair. Press through your right heel as you step onto the bench, bringing your left foot to meet your and extend your leg further, bend your knee and bring it close to your chest. Lower your raised leg back to the floor and return to the starting position by stepping down with the right foot as well. Position yourself into a staggered stance with your back foot elevated onto a bench or a step and front foot forward. Hold dumbbells in each hand, letting them hang at each side. Start the movement by lowering your body, keeping your front knee at a 90-degree angle, dropping your back knee to almost tough the ground. Extend your body back into starting position. Start in a standing position, slightly bending your knees. Hold your hands out at chest height. Lower your body quickly into a squat position, then explode upwards bringing your knees up towards your chest. Take another small break if you need it, and then go into donkey kicks. Start with your hands and knees on the floor (hands under shoulders, knees under hips). Keeping the knee bent at 90-degrees, keep your right foot flexed and knee bent, lift your leg to hip level. Lower your knee without touching the floor and lift again meeting hip level. Switch legs and repeat. Lie on your back with your legs extended side by side at a 45-degree angle. Contract your core muscles, making sure you lower back is firmly pressed into the floor. Swivel your legs so your right leg goes above your left leg and then swivel back to below making a letter C with the motion of each leg. Begin exercise in plank position. Start by bending knees and kick your legs forward to your hands. Kick your legs back to plank position so your legs are straight and transfer the weight onto your arms. Cooldown with some low-impact cardio and make sure to stretch!